Disney Interactive Studios has announced plans to release a video games based on “Alice in Wonderland,” the live action movie directed by Tim Burton that will be coming to theaters early next year. The iPhone and iPod touch are on the list of supported platforms, though the Mac is noticeably absent. Burton, whose previous credits include The Nightmare Before Christmas, Batman, and Sweeney Todd, is directing the movie, which stars Johnny Depp, Anne Hathaway, Helena Bonham Carter and relative newcomer Mia Wasikowska as Alice. The story takes place years after the events in Lewis Carroll’s classics “Alice’s Adventures in Wonderland” and “Through the Looking Glass,” when an older Alice finds herself once again in the surreal world of Wonderland — or Underland, as it’s known in the new film. 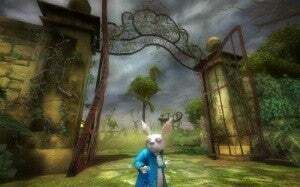 The video game picks up the story, where Alice, accompanied by friends like the Mad Hatter, March Hare, Cheshire Cat and White Rabbit, has to defeat the Red Queen and Jabberwocky. Each of the characters helps Alice to evade traps and solve puzzles. The game is currently in development for the Wii, Windows and Nintendo DS, according to Disney, which plans to release those in February 2010 — no Mac version was announced. Also in development is Alice in Wonderland: The Mobile Game for iPhone and iPod touch, which will be released in 2010.